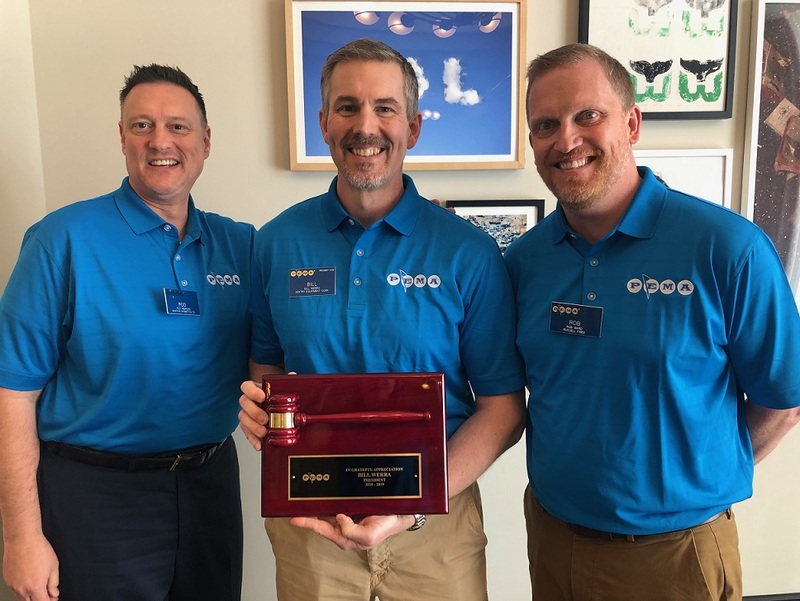 PEMA 2019 vice president Rod Henricks (left) and PEMA 2019 president Rob Ward (right) with 2018 president Bill Werra as the gavel is passed. Rob Ward, president of U.S. operations, Russell Finex Inc., was elected 2019 president of the Process Equipment Manufacturers’ Association (PEMA) during the Annual Meeting, Mar. 27-31, held at The Confidante, in Miami, FL. Also elected to office were PEMA vice president Rod Henricks, director of sales, Bunting Magnetics Co., and Treasurer Birte Mathis, CEO, Jacob Tubing L.P.
Also elected at the meeting were four new board members. The three new directors in the Class of 2022 are: Jason McDaniel, president & COO, French Oil Machinery Co.; Julie Whitten, manager, Vacuum Conveying Div., Piab USA Inc.; and John Winski, director of sales – Americas, Coperion K-Tron Pitman Inc. In addition, Andy Forrester, director of sales, Kice Industries Inc. was elected to the Class of 2021 to complete Birte Mathis’ term. Upon taking office, Ward acknowledged the value and focus of the past presidents and the tools and experience they have provided to make PEMA a thriving organization. He unveiled a new dashboard that will help PEMA measure its strategic planning success. Using the new tool to help PEMA meet goals, Ward predicts growth for PEMA and its programs and acknowledged and thanked PEMA committees for their time and involvement necessary to achieve these goals. Ward has been with Russell Finex Inc. for 20 years, with roles in the U.K. and the U.S. The company is a global manufacturer of separation and filtration equipment. With a background in sales and engineering, he has held various positions in the company, including vice president of sales. Prior to his Russell Finex employment, Ward worked for a U.K. engineering company in the automotive industry. Ward has a Bachelor of Engineering degree in Mechanical Engineering from the University of Newcastle upon Tyne. He and his wife, Anne, have two children and live in Charlotte, NC. Formed in 1960, PEMA brings together companies that supply equipment and systems that are used by process industries including but not limited to: food, chemical, pharmaceutical, waste water treatment, paint and coatings, agribusiness, ceramics, metals, plastics, wood, pulp and paper, environmental, building products, and mining/minerals.